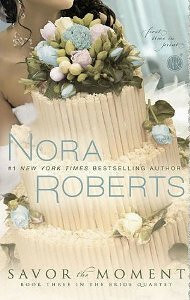 Savor the Moment is the third installment in Robert's Bride quartet series. I've been following this series from the get go even though I'm not a huge NR fan because I thought the whole wedding planner thing was an interesting concept, especially with a daughter that is going through the process now. The idea is that these four childhood friends have gone into the Wedding business. One is a Photographer, One a florist, one is a Baker and the final one is the juggler/organizer. These girls have been through alot in their lives and are now finding love. I did enjoy the first two books in the series (MacKensie & Emma's story / The Photographer & Florist) but this latest installment was a bit of a disappointment. This book was the story of Laurel, the Baker of the group who has held a torch for her best friend's brother since she was young. She was not of the same social circle as her friends due to her parent's bad investment and relationship choices but she was never treated as less by either Parker (her girlfriend) or her protective brother Dell. Because she was always part of the group, Dell has always seen her in a brotherly way although in the last book he was surprised when he confused her for a possible hook up before recognizing her as Laurel. When, after a huge argument, Laurel kisses him the relationship between them shifts and they decide to start seeing each other. Here is where the book goes into a stand still. Literally the story just sits there. They date, Laurel works on weddings, Dell disappears and pops up occasionally to date some more and that is it. Even the night that Laurel decides to sleep with Dell is barely a beep in the life of this story. I honestly was very disappointed in the book since it had HUGE potential and Roberts just let it slip by. Honestly! Laurel had some self worth issues that were barely poked at except during an argument with one of her friend's dysfunctional mother. Dell had some SERIOUS control issue that were also left untouched. So many openings for conflict and they were left untouched and therefore left the characters with no growth at all. Here is hoping that Parker's story will wrap the series on a high note because this one was a bit of a disappointment. I'm alive... and Reading some Baldacci! I'm alive. I am still ready (or listening if you are being technical about it). I've been reading some David Baldacci. I heart this man. He is my Dean Koontz (my sister loves Dean Koontz and reads everything he has been publishing lately). Baldacci really does it for me. I love him. I noticed he had a new book out last month and when I read about it I noticed that it was a second installment to a NEW series! I had not read the first installment when it was published in 2008 so I had the pleasure of reading BOTH books back to back. The Whole Truth is the first book in the Shaw & James series. Shaw works for some mysterious govermental agency that may or may not be sanctioned but the current goverment. He has fallen in love and is ready to quit but, of course, that won't be happening... Kate James is a journalist that has screwed up her career and has been swimming in the bottom of a bottle of booze for a while. When Shaw saves Kate's life she realizes that this guy just might be her ticket back to stardom. That relationship changes very quickly when she realizes that his life is going down the toilet real fast and the story she is after is not worth the world chaos it would cause. There is a puppet master that is pulling all the strings and it just might be too late for Kate to back away. The book was wonderful and I loved all the peeps we met. 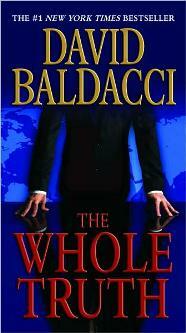 Typical Baldacci with characters that we just love and invest in. Shaw's personal tragedy and Katie's growth make us want more and more and more of them. 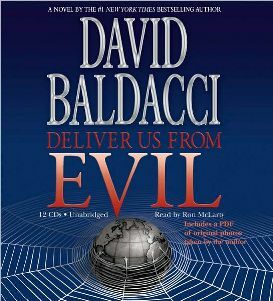 This year, Baldacci gave us the followup... Deliver Us From Evil. For some reason Kate is absent for most of this book so I was a bit disappointed there but we get a good serving of Shaw (still no first name, just an initial). We are also introduced to Regina who is on a mission to kill all the former Nazi military who have evaded judgement for their past crimes. She is part of a group of assasins that are methodically killing the officers that are known to have killed mercilessly. She meets her match in Evan Waller who is still as much a vicious killer as he was back in his youth. Shaw is in France to capture Waller who is trying to sell bombs to a terrorist group but finds that Regina (posing as a rich American) might be in danger from Waller. When he gets new orders he has to decide to either walk away from the mess or save the day. His actions put Katie, who is far removed from current events, in the sightline of a psycho killer. I would have loved more Shaw and Kate but it was enough to tied me over until the next book, which I'm sure I'll have to wait too long for.